I'm starting to feel like my brain is helium--floating and aimless--so I guess it's time I should start writing again. Writing and walking are the two mediums I use to drum up any intelligence I have left in my head. Not much is left. Why does having babies use up so much brain capacity? Does it ever regenerate? I love my babies though, totally worth becoming less intelligent. The truth is that this month marks my blogging ten year anniversary! I started this blog one day while filling in for my dad's secretary at the Clark Mechanical office on Columbia Lane. I had read a blog from someone who worked at a celebrity treatment center and was spilling all the secrets of the stars. I thought, THIS IS FANTASTIC! The first few posts I wrote were lame and a few people told me that it sounded like I was trying too hard. Eventually I deleted them all and started over. I think that's funny now because while I probably had more intelligent then, I lacked in self-confidence and I'd say those things have switched in their abundance. When I say self-confidence do you read "arrogance"? Oh well. So I've been a blogger for ten years now and that is wild. It's been the most intense ride. Blogging has given me opportunities and opened doors for me I never, ever thought possible. My life has changed dramatically. 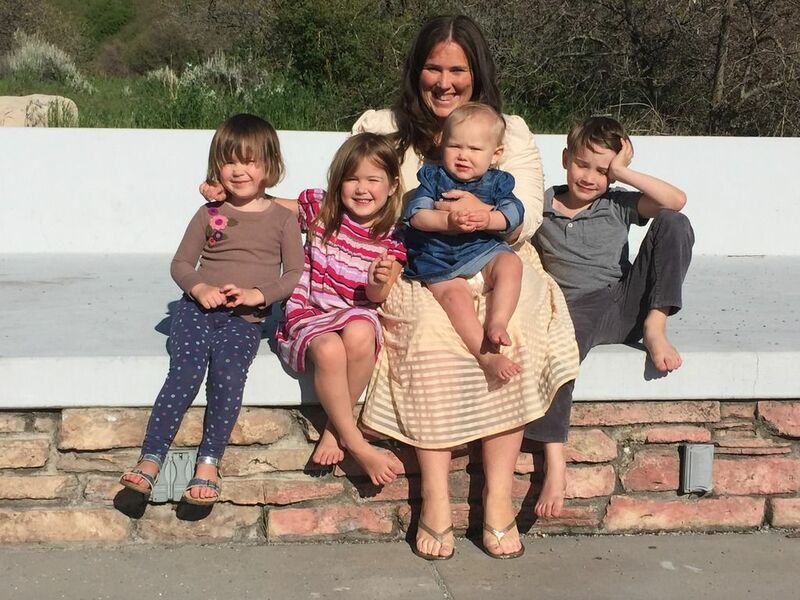 I started this blog to talk openly about infertility (because no one was talking about it) and here I am with four small children crawling to the computer at six in the morning so I can write. I thought about this anniversary a lot over the years. I thought I would do something big to celebrate. Write a book! Throw a bash! Make a slide show! Giveaway tshirts! But the truth is when May 2015 came this year I forgot all about it until one day I was in the backyard and it occurred to me my blog was ten years old and I looked over at Christopher and told him and he responded with a thumbs up. And that was it. But I like it that way. I like that this blog has changed shapes over the course of the last decade in my life. At certain points it felt all-consuming and overwhelming. It felt like an intense, demanding boss. It was our family's only source of income for awhile. It was a confessional. It was a canvas for my words and a mirror for my soul. It was (and still is) a window for me to see the world. This blog saved me many, many times.--spiritually, soulfully, socially, financially and purposely. Of course all of this wouldn't be possible without readers. I don't even know where to start to thank my readers. Readers have been kind and thoughtful, respectful and sweet. They've cheered with me and cried with me and left me and come back. They've pushed me, challenged me and corrected my "theirs". It still means the world to me when I get hugged at Costco from a stranger with tears in her eyes. I am a lucky woman. I know that. Before I sign off, I wanted to write perhaps one of the most touching moments I've had during this decade of blogging. My mom and I had gone to a lecture given by the prophetess Joanna Brooks. I was hugely pregnant--due any day. After the lecture Joanna came up to me on the front row and kissed my belly. It was so beautiful. I felt the blood in my body go warm. And just as she did that a woman came up from behind me and slid a tiny piece of paper into my hand and bolted for the door. It all happened so fast I didn't really get to see what was going on, but she looked to me like a twenty-something college student with a backpack and wavy short hair, all in black. Because there were friends and peers to chat with I didn't get to read the slip of paper until I was back in our car ready to go home. When I opened it up it was tiny--smaller than a gum wrapper and it had the words "Your writing has changed me." I think it was her vulnerability bumping up against mine. It felt like she was as scared to hand me that paper as I am when I write something that pushes my cultural boundaries. I felt like we were giving each other permission to be brave. It still makes me cry when I think about it. There hasn't been a day in the last ten years I haven't questioned myself for being a public blogger. I've been told many times I spill too much, I tell too much, I overshare and I will regret it when I am older. And while there are certain blogpost that make me cringe for writing them, I have to say though I don't regret them. I don't regret this. This has been my life's work. And if one person, if one woman on the U of U campus thinks my words are useful, I am telling you, that's is enough for me. It's actually more than enough. Happy ten year anniversary. Thanks for being around.